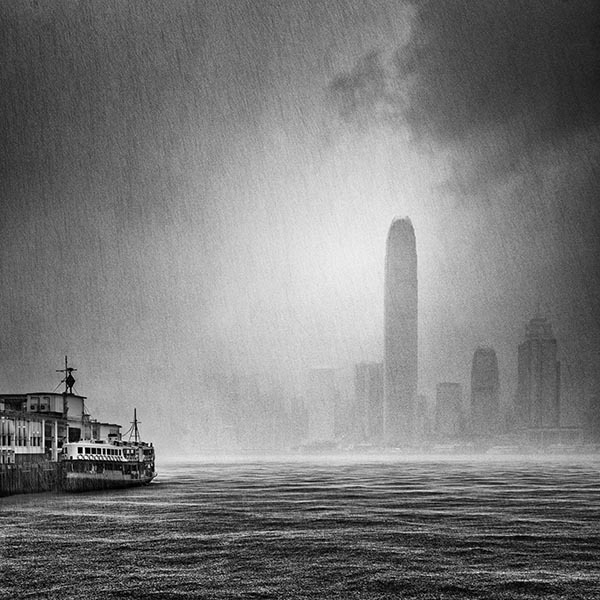 The photo above is a view looking across Victoria Harbour at the skyscrapers lining the Hong Kong waterfront during the most amazing thunderstorm that I’ve ever experienced. This is the first in a series of features describing some of my favourite photos. All of the photographs on this website are personal and have a story behind them but the ones that I intend to write about in this blog are ones like this that I still think about all the time – photos that I consider as special in some way or pivotal in my development as a fine art landscape photographer. Hong Kong is a city that I had wanted to visit for a long time and in the summer of 2014 I finally got the chance. One of the sights that I was eager to see for myself and to try and photograph was the famous skyline of Hong Kong Island with its iconic skyscrapers that line the waterfront of Victoria Harbour. If you look at a map of the area you will soon realise that the obvious place to stay if you are interested in photographing Hong Kong is not actually Hong Kong Island itself but rather Kowloon which is located on the opposite side of Victoria Harbour. It offers spectacular views across the water over to the city’s dramatic skyscrapers. 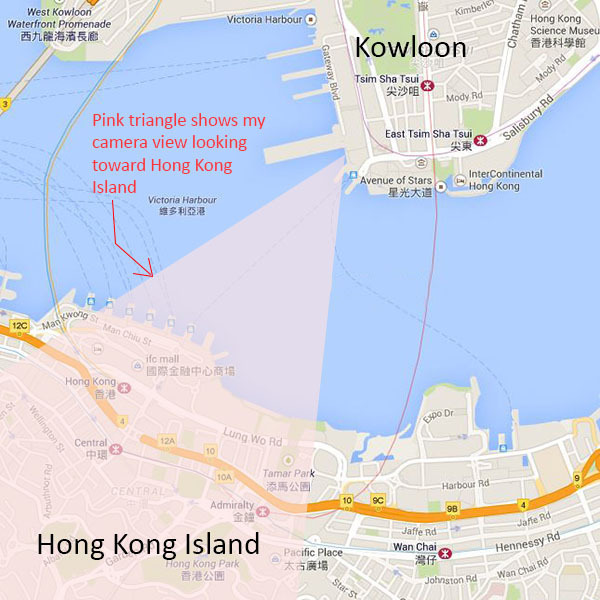 The pink triangle on the map shows the view through my camera with the point of the triangle being my location on the Kowloon waterfront. Each morning therefore I would leave my hotel in Kowloon well before dawn and walk south down Nathan Road toward the harbour. Each morning I would visit a different part of the waterfront exploring a variety of views across the harbour with my camera, hoping against hope, in the way of all landscape photographers, that the weather would be dramatic or that the light would be beautiful! Summer time in Hong Kong brings hot, humid and unstable weather. It doesn’t rain very often, but, when it does, the intensity of the rain is unbelievable – living as I do in the north of the UK I thought I knew everything there was to know about rain in all its various guises but I’ve never seen anything like the intensity and volume of the rainfall during the dramatic thunderstorms I experienced during my brief stay in Hong Kong. As a visitor to the city these storms always seemed to catch me by surprise. They would arrive suddenly out of clear blue skies at the most unexpected of moments and then depart just as quickly. You can therefore imagine just how excited I was one morning down at the harbour front with my camera when I saw one of these unpredictable monsoon thunderstorms moving rapidly across the Hong Kong city skyline. Within minutes the torrential rain began to fall so heavily that photography would have been impossible except for one lucky accident - my location that morning was next to the Star Ferry terminal at Tsim Sha Tsui and there was a covered walkway nearby that I was able to use for shelter whilst I continued to photograph the storm. I guess we all have wonderful memories of the times in our lives when we have been in just the right place at the right time – this was one of those moments for me and I was lucky enough to be able to photograph it. I’ve had it printed using archival pigment inks onto Permajet’s Museum 310gsm matte fine art paper and it looks amazing framed on the wall at home.